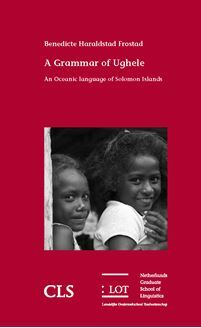 Ughele is a language belonging to the Oceanic subgroup of Austronesian languages . It is spoken by two communities inhabiting neighbouring villages , Ughele and Egholo , on the island of Rendova in Western Province , Solomon Islands . This dissertation represents the first description of the Ughele language to this date . It consists in 25 short chapters that covers essential information about its phonology , morphology , syntax , pragmatics and discourse structure , with most emphasis put on morphology and syntax . In addition , it contains a brief introduction to one of the Ughele speech communities , and an appendix with word lists and a few Ughele texts with interlinear glosses and translations .